Preqin’s Private Equity Online database tracks 356 public pension funds and 462 private sector pension funds based in North America, which hold $7.5tn in combined assets under management (AUM) and allocate approximately $530bn to private equity. The average North America-based public pension fund allocates 7% of its total assets to private equity compared to a target allocation of 8.3%, while the average North America-based private sector pension fund has a current allocation of 6% and a target of 7.3%. Public and private sector pension funds together make up 26.9% of all North America-based LPs investing in private equity. The largest North America-based public pension fund in terms of current allocation to private equity is CPP Investment Board, which invests $42.3bn in the asset class. TIAA-CREF is the largest North America-based private sector pension fund, with $13.5bn allocated to the asset class. 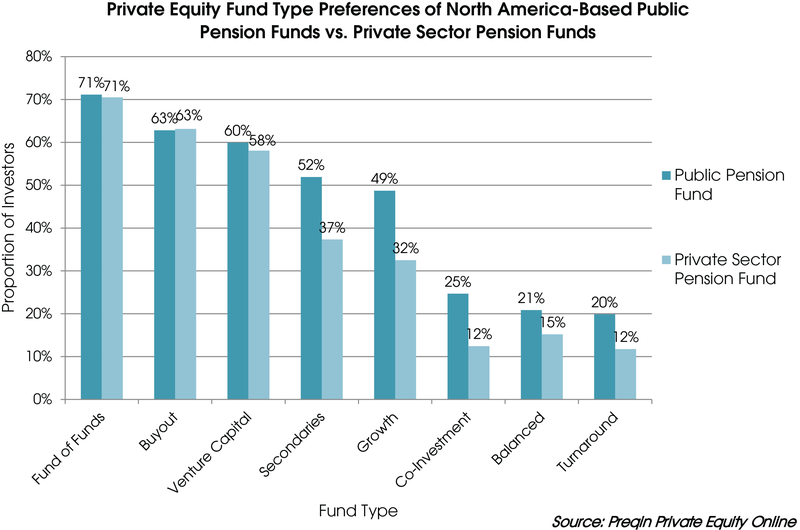 Private equity funds of funds are the fund type of choice for the majority (71%) of North America-based public and private sector pension funds alike. Buyout and venture capital vehicles are the second and third most preferred respectively among both private sector and public pension funds. Public pension funds, however, are more likely to target secondaries, growth and co-investment funds compared with their private sector counterparts. The greatest difference in fund type preferences between North America-based public and private pension funds is their exposure to growth vehicles, which are targeted by 49% of public pension funds but by only 32% of private sector pension funds. In terms of geographic preferences, the vast majority of North America-based private sector pension funds (91%) and public pension funds (85%) invest in private equity funds focused on their own domestic market. Europe-focused vehicles are targeted by a similar proportion of both private and public pension funds (63% and 61% respectively), while public pension funds are more likely to seek Asia-focused vehicles than private sector pension funds (55% versus 47% respectively). In the next 12 months, both North America-based public and private sector pension funds will be committing further capital to private equity. One such investor is public pension fund Teacher Retirement System of Texas, which is looking to commit between $3.5bn and $4.5bn to various North America-, Europe- and emerging markets-focused private equity vehicles in the next year, including buyout, venture capital and growth. Another is Toronto Transit Commission Pension Society, a Canada-based private sector pension fund, which intends to commit up to CAD 100mn to buyout funds in the next 12 months in an effort to meet its target allocation of 5% of total assets.